Tibet - mysterious land of high mountains and snow. The rooftop of the world holds our imagination as few other places do. With a history that can be traced back thousands of years, life in Tibet has always been marked by the deep religious tradition and a hard life in harsh mountain climate. 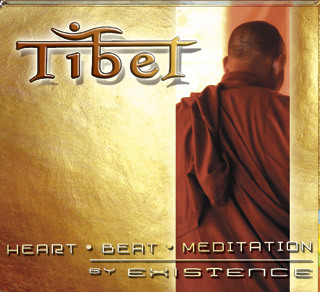 TIBET - Heart Beat Meditation. Again she invited a range of musicians and singers to join her on this musical adventure. Her very special guest in Minho Sound Studios was the Tibetan singer, composer and well known Thankha painter Phenpo Tendhar Tenzin Dhargay. Born to a high-reputed family of thangka artists, he keeps up this tradition in the 9th generation. With his spiritual background and knowledge of the Tibetan Buddhist tradition he was of great help in the selection and pronunciation of the Mantras and tunes. Margot also got the chance to bring the Kachoe Ghakyil Tibetan Buddhist Nuns Choir of the Kopan Monastery into the project. The sound engineer of EXISTENCE, Tom Bates personally recorded the Nuns Choir on location in Nepal. Intoning these sacred mantras, their voices complement the compositions in a meditative way. Creatively arranged in the style of Existence with instruments such as Tibetan Horn, Mongolian horse head violin, Sitar guitar, chimes, flute, Tibetan bells and cymbals the music obtains a great degree of authenticity. Percussion, drums, bass, acoustic and electric guitars create the mystic background of this production. TOM BATES, the American producer and sound engineer, winner of 8 Grammy Awards, sets standards for the highest quality in sound and performance on this production of the project EXISTENCE. More infos and fotos about the country Tibet . . .